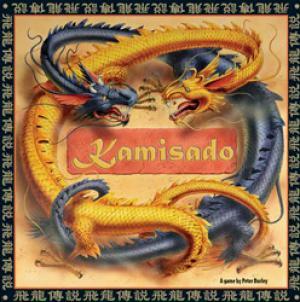 Kamisado reaches a new level in the world of strategy board games! 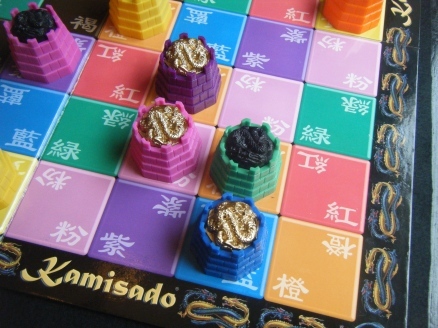 Kamisado (designer P. Burley ) is played on an 8x8 grid , with eight different colors appearing on eight tiles each. The 2 players have eight differently-colored pieces that start in their back row, and the goal is to move one of your pieces to the opponent starting line. Players take turns moving pieces forward (either straight or diagonally),but the piece you move must match the color of the square on which the opponent landed in his previous turn. 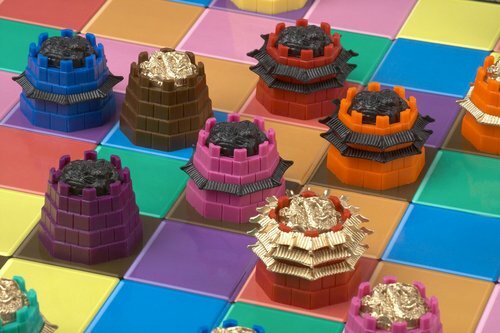 When you reach the opponent home row with a piece, you score one point, players reset their pieces in the home row according to certain rules, and the piece that reached the opposite side is upgraded to a Sumo dragon tower. This tower can move fewer spaces, but it can also push an opponent piece, thereby forcing the opponent into a null play and effectively allowing you to choose the color of the piece that you will move next. The red tower has a triple sumo rank ! 1 ex display like new copy available for sale please contact us! The new P. Burley 2nd print (8 x 8 grid) has a tray for the golden and black rings, a symbol instead the dragon on the top of the tower pawn. The dragons have been replaced by an 8-pointed star design which looks really nice and fits in perfectly with the shape of the towers.